Аннотация к книге "Nuremberg: Evil on Trial"
As the Second World War ended, the first army unit to come across the Nazi leaders could have executed them summarily. Or their judgement might have fallen to the German people, as at the end of the First World War. But an international military tribunal offered the unprecedented opportunity for them to be fairly tried and damned only on the evidence of their own meticulous documentation of genocide, war crimes and other atrocities. In November 1945, 22 of Nazi Germany`s leading figures took the stand in a trial that foreshadowed the trials of war criminals in Bosnia, and Saddam Hussein in Iraq today. 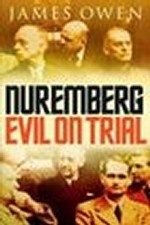 Nuremberg: Evil on Trial reveals the courtroom drama that unfolded. Sixty years after the verdict and executions, using original transcripts and incisive commentary, this is a comprehensive yet accessible account of a key moment in world history.